A great opportunity to nurture yourself through an in-depth taste into what makes Dru yoga different. This workshop is a wonderful chance to experience the flow and power of Dru and ideal for those considering doing the Dru Yoga Teacher Training starting in Aotearoa in March 2019. Treat yourself and enter your inner world to rest and rejuvenate through Dru. Workshop Leader and Senior Tutor Dru Australasia, Patricia Brown, combines respected health professional, global humanitarian and freelance yoga philosophy writing mantles to create a successful holistic approach to Body/Heart/Mind wellbeing. This 3 hour workshop is ideal for beginners and experienced yoga practitioners alike. Transform the world by giving people the tools to transform themselves. Cancellations—If you cancel (because of illness or some other unforeseen circumstance) then we give you the option of transferring the event fee to a future Dru Australia course or event or to the purchase of other Dru Australia services. If we cancel a Dru workshop, we give you the option of the event fee being reimbursed, or transferring it to a future event. Bottom tab 2 - title What to bring? Please wear loose comfortable clothing, bring a yoga mat or rug and a bottle of water. Bring a notebook and pen to write down this helpful tips and wisdom shared. Please arrive at least 10 minutes before the start so we can start on time. Please wear loose comfortable clothing and bring a yoga mat, rug, cushion and bottle of water. Share the experience—why not bring a friend with you! Some of our great meditation, yoga and relaxation products will be available to help you take the experience home. 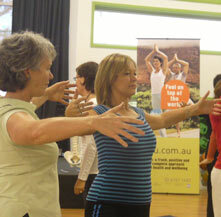 Other Dru Yoga workshops may be available in your area. If one isn't currently scheduled, our tutors are happy to consider organising an event in your area. Please let us know if you would like further information. Workshops in other regions Can't make the dates in your area? Check out the other dates and venues available nation wide. 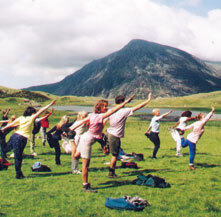 Dru Yoga teacher training courses Looking for a yoga course? Dru Yoga is one of the fastest growing yoga schools in Australasia, training highly qualified and empowered Dru Yoga teachers. © Copyright 1987-2017, Dru (UK), Dru Australia. All rights reserved.